How to Upgrade PS4 Hard Drive to Larger Drive without Losing Data? If you want to upgrade your PS4 to larger drive, then, clone PS4 hard drive to larger drive should be the best way that you can upgrade PS4 hard drive without losing data. Why you want to clone PS4 hard drive to larger drive? PS3 and PS4 hard drives store a lot of games, and their hard drive space can quickly run out of space. When you need to save more games on the hard drive, you cannot install games successfully because the volume is not enough to store more data. Thus, you need to upgrade the small hard drive with a larger HDD or SSD to improve the performance of your PS3 or PS4. And make a disk clone should be the best way to upgrade PS4 drive to larger drive without losing data. Here you can take use of AOMEI Backupper, which has the great feature Disk Clone, can help you clone PS4 hard drive to larger drive without losing data. How to clone PS4 hard drive to larger drive? Upgrade PS4 hard drive to bigger one is a nice way to solve the low space problem. Clone PS4 hard drive to larger drive with AOMEI Backupper should be the best way. AOMEI Backupper, the powerful disk cloning software, can help you upgrade PS4 hard drive without losing data. The next content contains the detailed steps of how to clone PS4 hard drive to larger drive with AOMEI Backupper. A larger HDD or SSD. AOMEI Backupper Professional. Or, you can download the free edition AOMEI Backupper Standard in there official site. Step1. First, connect your PS4 hard drive and the larger drive you prepared before to your Windows PC. Then, install AOMEI Backupper Professional to your computer, launch it. 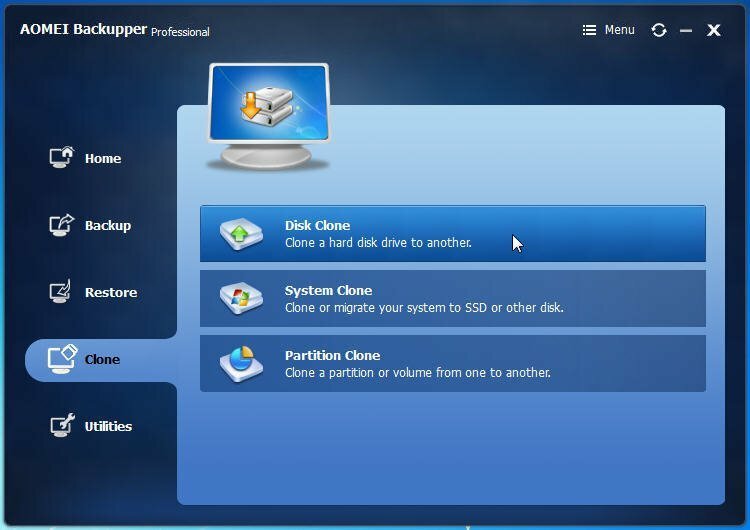 To clone PS4 hard drive to larger drive, here you need to click Clone->Disk Clone. Step2. Then, choose the PS4 hard drive as the source disk, click Next. Step3. Choose the larger HDD or SSD you prepared before as the destination disk. Click Next. you can edit the partitions’ size on the destination disk, just open the settings icon of “Edit partitions on the destination disk”. You can decide to make a quick copy or an exactly copy. If you want to copy every byte on the PS4 hard drive, you can check the box of “Sector by sector clone”. If your destination disk is an SSD, it is necessary to check the box “Align partition to optimize for SSD”. It can optimize the performance of SSD after cloning. After all the settings, you can click Start Clone to execute the task immediately. After cloning, you can replace the PS4 hard drive with the larger drive. AOMEI Backupper is more than a disk cloning software. It is also a backup and restore software that you can backup hard drive easily. When you need, you can use it to restore backup images with simple clicks.